A new federal proposal would halt the upward trajectory of car and light truck fuel economy that began in the early 2000s. Source: Light-Duty Automotive Technology, Carbon Dioxide Emissions, and Fuel Economy Trends: 1975 Through 2017, U.S. Environmental Protection Agency. January 2018. Standards ensuring continued progress through model year 2025 are already saving consumers billions of dollars at the gas pump, adding automotive sector jobs, and reducing harmful emissions. Yet the new proposal would flatline fuel economy and greenhouse gas emissions standards starting in 2020 and eliminate states’ option to set more stringent standards. The Department of Transportation and the Environmental Protection Agency (EPA) are now taking comment on their proposal. The original Corporate Average Fuel Economy (CAFE) standards for cars were adopted in 1975 and went nearly unchanged for 30 years. The Energy Independence and Security Act of 2007 (EISA) required that updated standards of at least 35 miles per gallon (in laboratory testing) be adopted by 2020, and that the standards remain at “maximum feasible” levels thereafter. In April 2010, the EPA and the National Highway Traffic Safety Administration issued harmonized fuel economy and greenhouse gas (GHG) emissions standards for model year 2012-16 cars and light trucks. The joint rulemaking set the first national GHG standards for vehicles. Cars and light trucks together were required to achieve a fleetwide average of 34.1 miles per gallon by 2016. 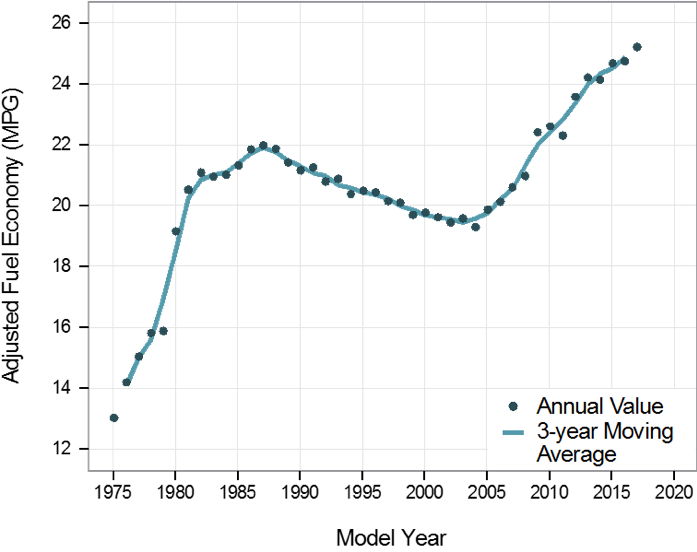 Two years later, in August 2012, an updated rule called for model year 2017-2025 vehicles to increase the fleetwide average to 48.7 —49.7 mpg by 2025. The nation's first fuel economy rule for heavy-duty vehicles was finalized as well in 2012. To facilitate compliance with the higher standards, fuel economy legislation should be complemented by a combination of policies, including: incentives for the purchase of highly- efficient vehicles; consumer education efforts; and continuing vigorous R&D on fuel-efficient, low-emissions vehicles.